FT. LAUDERDALE, Fla., Aug. 21, 2018 /PRNewswire/ — Florida Magazine Association, Inc. (FMA), the largest state magazine association in the U.S., awarded Broward County-based Lifestyle Media Group with 12 honors at its Aug. 10 annual Charlie Awards at Hilton Orlando Bonnet Creek in Orlando. 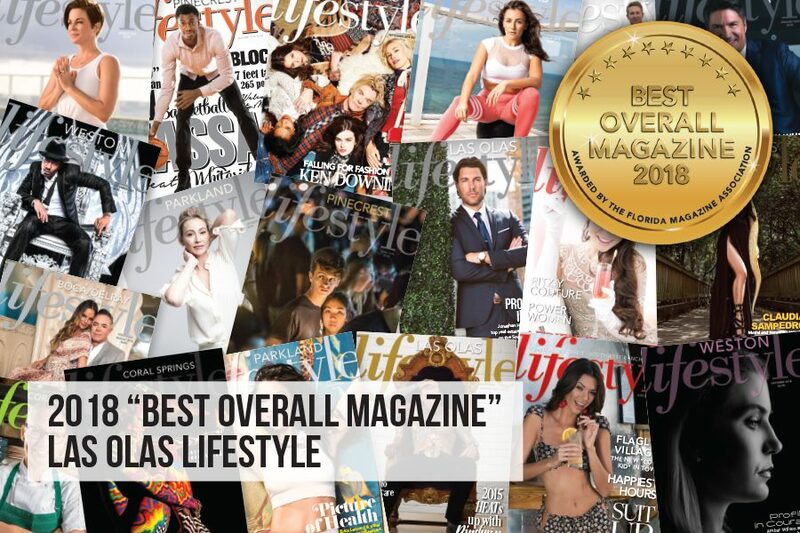 Lifestyle magazine, part of Lifestyle Media Group’s portfolio of publications, earned 10 first-place honors, including the coveted “Best Overall Magazine” award in its circulation bracket (20,000 and under). Lifestyle magazine took home more first-place awards than any other publication in Florida. Lifestyle Media Group poses with their awards. The annual Charlie Awards competition recognizes publishing excellence involving magazines produced in the state of Florida. Nearly 500 entries were submitted to this year’s competition that recognizes publishers, writers, editors, artists, photographers, printers, marketers and others as the best among their peers in scores of categories. Overall, the magazines of Lifestyle Media Group collected 12 FMA honors in a range of categories, including writing, graphic design, illustration and photography. Lifestyle magazine earned 11 of those awards, and South Florida Business & Wealthmagazine took home one. Among the first-place honors bestowed on Lifestylemagazine were awards for “Best Overall Writing” and “Best Special Theme Issue” for its April 2018edition dedicated to the Parkland community in the aftermath of the shooting at Marjory Stoneman Douglas High School. * All Lifestyle awards are in the consumer, 20,000-under circulation category; South Florida Business & Wealth award is in the trade/technical category. Lifestyle Media Group (LMG) is the largest and fastest-growing magazine publisher in South Florida, with a combined readership of nearly 1 million readers. Its 14 titles include South Florida Business & Wealth, which connects business leaders and C-suite executives throughout the tri-county area; Lifestyle, with nine South Florida editions that connect people and businesses to their local communities; Tampa Bay Business & Wealth, the most comprehensive business publication in the Tampa Bay region; and Tribal Business Journal, a national publication serving Native American business interests from coast to coast. For more information, visit https://lmgfl.com/. To subscribe to Lifestyle magazine (12 issues for $39.95), call Monica St. Omer at 954.666.5331. For information regarding advertising and partnerships with Lifestyle, call Dan Fudge, vice president/ad director at 954.666.5316. About Florida Magazine Association Inc.
Durée Ross/Durée & Company, Inc.